A $10 million dollar program by the U.S. Department of Labor is intended to eradicate child labor in the world's top cocoa growing region. Analysts say the program faces a difficult challenge. 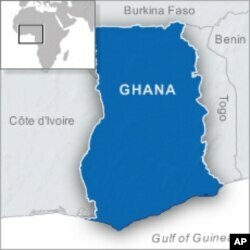 Ghana and Ivory Coast share borders, but they also share a common cash crop, cocoa, which often is grown using child labor. Researchers estimate that several hundred-thousand school-age children carry heavy loads, spray toxic pesticides and swing sharp machetes at cocoa pods throughout West Africa's fertile hillsides. Kevin Willcutts is a Deputy Director for the department's Office of Child Labor. He says he is encouraged by growing concern among West African governments and international labor organizations. "We're at a point in time when we think we have a real opportunity because with the signing of this joint declaration, the parties are coming together and saying that we share a commitment to address the situation and to offer children better hope for the future through education," he said. The $10 million support and research program aims to help local cocoa farmers boost their profit margins so they do not need to rely on cheap child labor. The program spreads strategies that local communities have successfully used to wean themselves off child labor. It also seeks to help the governments of Ghana and Cote d'Ivoire better enforce child labor laws. But Daan de Vries is with UTZ CERTIFIED - a sustainability program that seeks to create an open and transparent marketplace for agricultural products. He says it will not be easy to implement regulations on often isolated farms where cocoa is produced. "I think what you have to realize about cocoa is that it's often grown in very remote areas. If you look at tea or palm oil, it has to be processed within 24 hours of plucking, or even if you talk about pineapples, they have to be flown fresh to the supermarkets so they're often closer to the cities," he said. "If you're talking about cocoa and about coffee, these are crops that often are grown in much more remote areas. So by nature, they are less regulated; there's less enforcement; there's often more poverty. So you will see more of these issues." Ivory Coast is the world's leading cocoa grower. Together with Ghana, the two neighbors harvest about half of the world's supply of cocoa beans. Harvests been a blessing for state coffers. But critics say the funds also have been used to finance arm purchases by both sides in Cote d'Ivoire's civil war. Cocoa also has financed cartels of child trafficking in West Africa, where UTZ CERTIFIED Program Manager Daan de Vries estimates that as many as 12,000 children are being forced to work on cocoa farms. "We have to be realistic that it's not a problem that is only specific to cocoa. If children don't work in cocoa anymore, you might see them popping up in other sectors, so we have to be realistic," he added. "Child labor was common in Europe and the U.S. a century ago, so it might take decades even here [to end it]." Bama Athreya, executive director for the International Labor Rights Forum, says the U.S.-Ghana-Ivory Coast partnership is one of many signs of the growing political will to address the problem. But she says more needs to be done by major cocoa purchasing corporations that often turn a blind eye to child labor. "There's been a real unwillingness to act that I think is driven by the business proposition of getting cheap child labor to produce the cocoa for quite some time," she said. "And that is a major challenge." But Athreya says she is optimistic that West African governments have the expertise and the determination to lead the campaign and against child labor. "We need some fundamental reforms, frankly, in the cocoa industry, in the cocoa supply chain that creates some more transparency, that make it very clear where the revenue is going, that ensure that more revenue remains in country, and that ensures that that revenue is actually spent appropriately," she said. Worldwide, prices and demand for cocoa are on the rise, Athreya says. That, she adds, offers Ghana and Ivory Coast a chance to fully fund their education programs, and offer their children a future different than cocoa farming.